This letter template is designed to assist in the production of a letter from one proposed contracting party to the other proposed party, suggesting amendments to a contract that is under negotiation. Three different forms of amendments are covered: additions, deletions and substitutions. 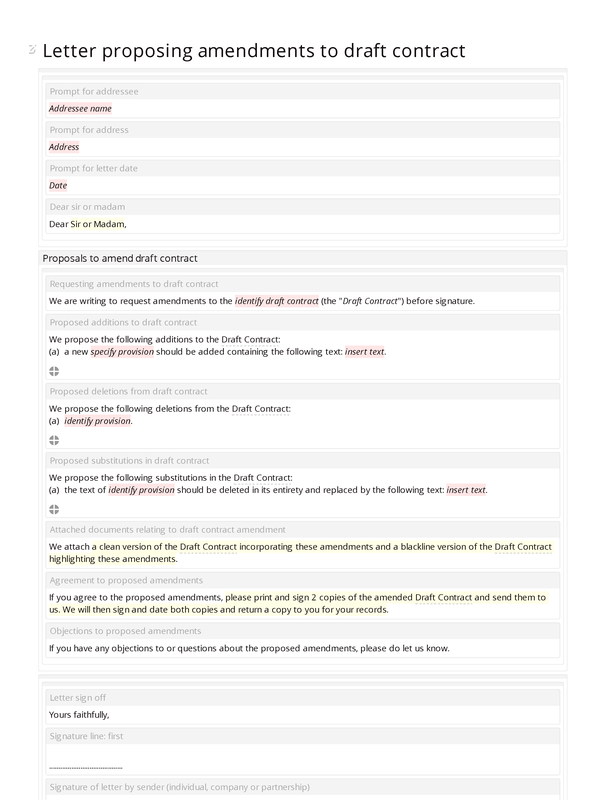 The document also invites the recipient, in the event that the suggested amendments are agreed and there are no further amendments, to print and sign the contract, and send it to the sender for counter-signature. Requesting amendments to draft contract; proposed additions to draft contract; proposed deletions from draft contract; proposed substitutions in draft contract; attached documents relating to draft contract amendment; agreement to proposed amendments; objections to proposed amendments.